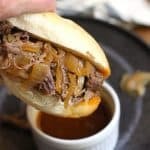 Slow Cooker Beef Au Jus Sandwiches are easy enough for weeknight meals, but special enough for weekend entertaining. These are a trip down memory lane for me, as my mom made these sandwiches for us numerous times over the years. Use hoagie rolls for serving, along with a side of mashed potatoes! Roast beef was THE comfort meal for us growing up. I can remember having roast beef with potatoes, carrots, and onions – many many times. Later on, Mom started making more beef au jus sandwiches. She always served the beef on her french bead, which is the perfect bread to soak up all that juice. I added a step to my recipe that includes tomato paste, which is why the broth turned an orange color. Tomato paste gives the beef a full hearty flavor. 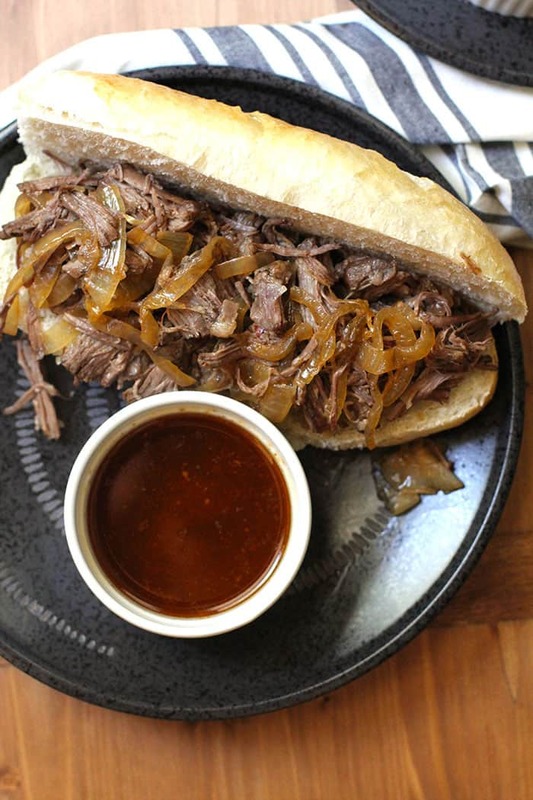 Mom never wrote down a recipe for her beef au jus sandwiches. But she talked me through it several times over the phone. The ingredients I used are a little different than what she did, but the method is the same. Season the meat and sear it on all sides on a pan on your stove top. Set aside. Add tomato paste to the same pan, and add onion along with spices and a little broth. Cook until beef is falling-apart-tender. Shred beef and remove visible fat. Strain broth into a separate bowl for au jus. 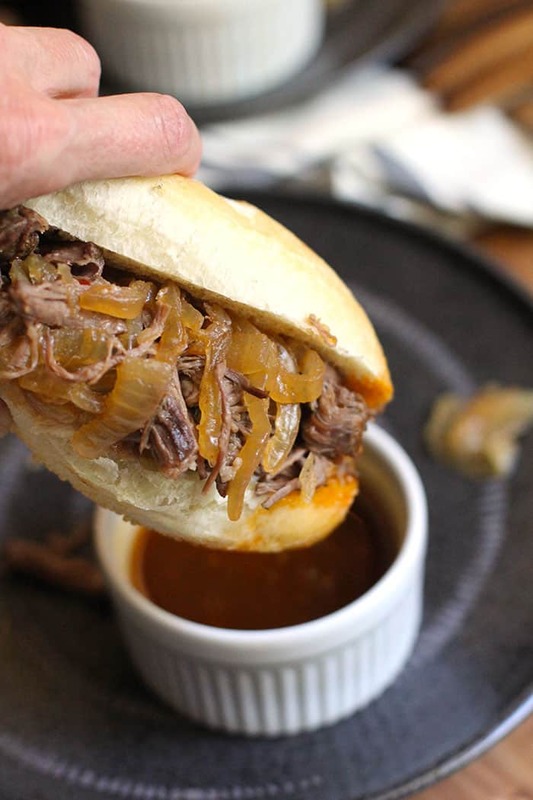 Serve with homemade french bread (or store bought is fine) and the au jus. I cooked the beef for about 4.5 hours on high, but if you are putting it on before work in the morning, it could cook on low for about 8 hours or so. 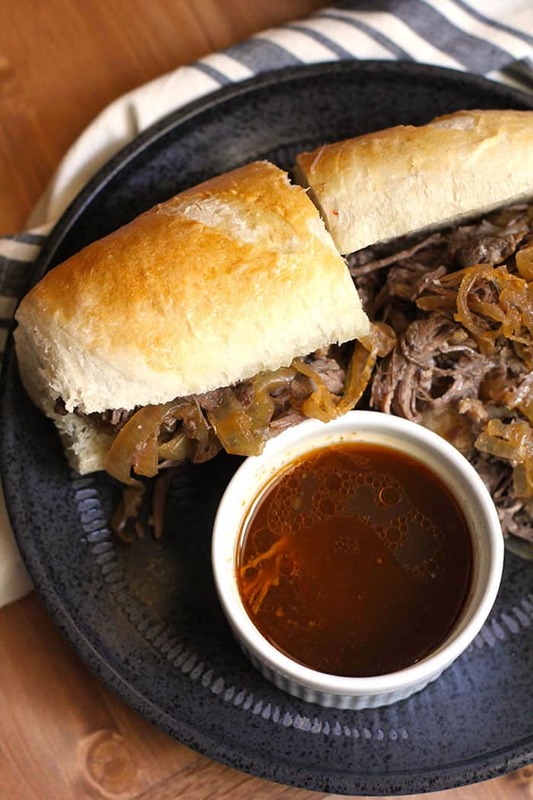 Just in case you didn’t know, Au Jus means With Juice, which is why you should always remember to keep the liquid, strain it, and serve it on the side. When we ate this meal, I was reminiscing about the “old days” and how roast beef was usually the first thing Mom cooked after a vacation. Which was why I made these Beef Au Jus Sandwiches the day that Zach came home after a weekend in Austin. He said he “couldn’t wait for a homemade meal”. That was all I needed to hear to get the memories flowing. 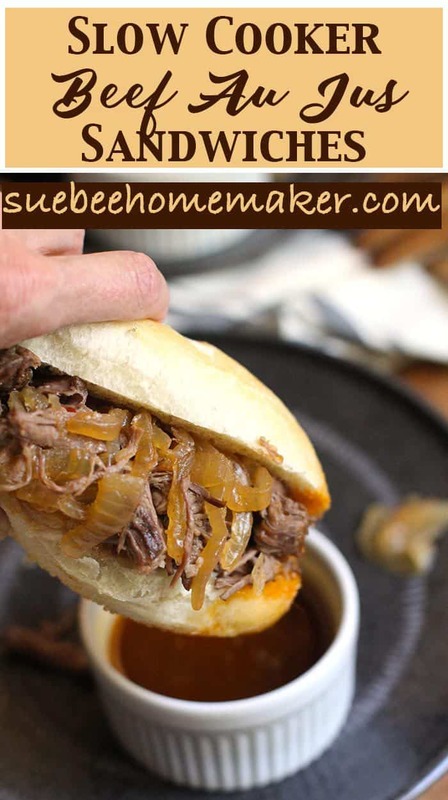 Hearty beef sandwiches, using a pot roast, onions, and spices. Let it cook all day long for tender beef. Liberally salt and pepper the beef chuck roast. Heat a pan to medium high heat and add olive oil. Get it good and hot. Then add roast and sear on all sides. This will help the roast hold in the juices. 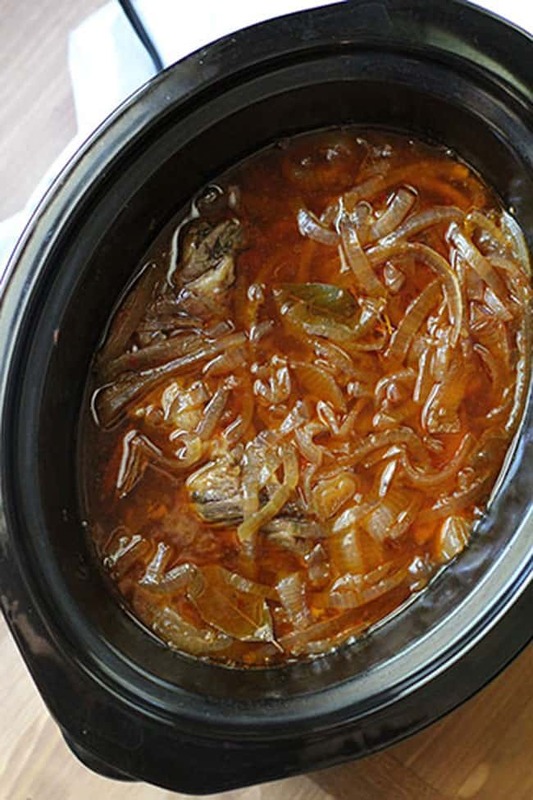 Place roast in a crock pot. Put pan back on stove and add tomato paste and a 1/2 cup of beef broth. Stir around to get all the brown bits moving around. Add sliced onion, garlic powder, onion powder, red pepper flakes, and minced onions - and sauté for a couple of minutes to absorb the flavors. Pour onions and juices over the roast. Add the remaining broth, Worcestershire Sauce, and bay leaves to the crock pot. When the roast is very tender, remove to a separate dish along with the onions. Let sit about 15 mins before shredding, and remove visible fat. Strain the broth through a fine mesh strainer, reserving the juice. Discard bay leaves. To serve, fill the hoagie rolls with shredded beef and onions. Pour the au jus in small bowls for dipping. 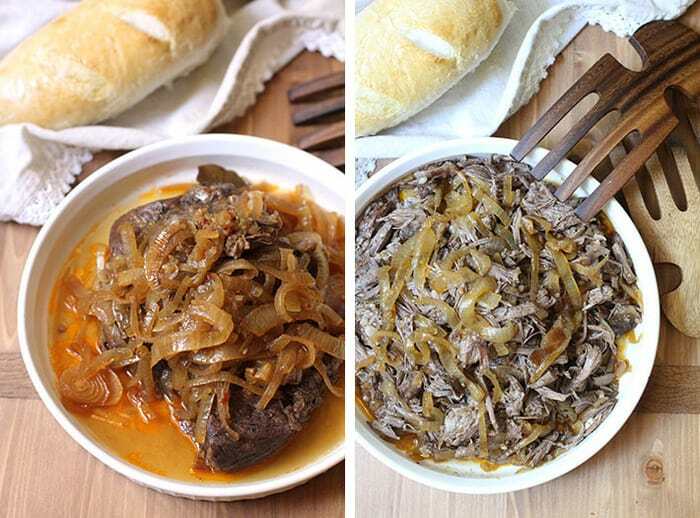 Choose a cut of beef that works well with the slow cook method, like a chuck roast, pot roast, rump roast, etc. Ask your butcher for their suggestion. If the roast seems tough, it most likely needs to cook longer. This recipe is a must and if you are lucky enough to eat with the French bread. Oh my! ❤️??? ?